Have you fallen in love with a certain fluffy, big personality in a small body, short-legged dogs? You know what we’re referring to right now, Pembroke Welsh Corgi puppies! 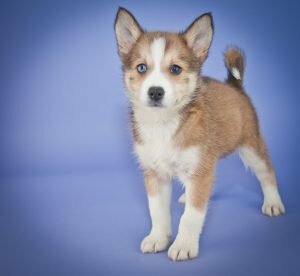 You’ve been searching “Corgi puppies for sale near me” for some time now and you’ve finally made your decision to get one of those adorable Corgi puppies. Are you well informed about this beautiful breed? Take some time to read 5 fun facts about them. While you’re at it, take a look at our available puppies page to see pics of our Corgi puppies. We think this is one of the most commonly known facts because Corgis have been pictured so often with the Queen of England. She has really popularized them without even knowing or trying. Queen Elizabeth II has had over 30 Corgis in her lifetime. Across the pond, we tend to think their royalty is why so many Americans searched “Corgi puppies for sale near me,” in attempts to grab a piece of royalty! Fact Two: There Are Two! 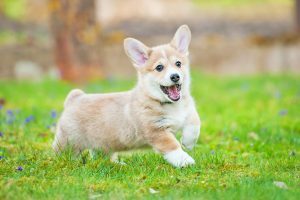 Did you know there are two different types of Corgi puppies? Yep! There’s the Pembroke Welsh Corgi and the Cardigan Welsh Corgi. They are considered two entirely different breeds because they come from different ancestors. The best way to tell them apart is with their tails. The Pembroke doesn’t have one and the Cardigan does. Fact Three: Have You Heard That They Herd? Kinda hard to believe that these little ones were once herders, but they were and they were darn good at it. Back in the 10th century, pastures were considered common land, so there were no fences. In order to keep cattle together, the Welsh Corgis would nip at their legs to herd them. In 1107, Flemish weavers migrated to Wales and bred the Spitz-type dog with the original Cardigan Corgis. The result was Pembroke Welsh Corgi puppies. There were two types of Corgis registered as one in 1925, which caused a little controversy in the breeding community. After about a decade filled with a lot of back and forth, they were finally recognized as two separate breeds in 1934. At Petland, we always have Corgi puppies in our stores, so search no more for “Corgi puppies for sale near me,” because we have exactly what you want. Give us a call today! At Petland, we totally understand that not everyone wants a pint-sized small breed dog. There are plenty of dog owners who have more love to give to the cutest big dog breeds in the world! Take a look at this list of 5 large dog breeds that tug at hearts universally! Want to see all our gentle giants before diving into this list? Just click here for all of our available puppies. The Siberian Husky is a well-known member of the American large dog breeds. Huskies are clever and loving and insanely smart. They aren’t aggressive and would fail miserably at being a guard dog or even a watchdog. They get along swimmingly well with strangers, so there’s that! Huskies are very intelligent and trainable, but patience, consistency and an understanding of the Arctic dog character are necessary. These 55-pound furballs are just simply precious. There isn’t any way on the planet that one could possibly think of large dog breeds without immediately envisioning the Great Dane. That’s why they’re so known – because of their size! They reach heights well over 30 inches tall. The famous Great Dane named Zeus held a world record standing at 44 inches. Tapping out at an average 150lbs, these gentle giants have a lot of love to give. These couch potatoes aren’t nervous or aggressive. They are just the opposite, because they are incredibly gentle and goofy, all 85 pounds of them! The most aggression they’ll ever display is herding kids in and out of rooms, by gently bumping them. They are one of the cutest big dog breeds with intelligence and sociability. They truly thrive best in rural or farm like settings where they can get proper exercise and then properly nap! Standing at nearly 3 feet tall and weighing a grand total of 120 pounds, Irish Wolfhounds are large dog breeds times two! They were originally bred to hunt wolves in Britain and Ireland, but they are far from ferocious. They are a gentle and quiet breed that absolutely gets along with everyone and we mean everyone – kids, strangers, and other dogs! Make room for these oversized babies, because they like to stretch out and they’ll need the space for it! Nicknamed “Nature’s Nannies,” the Newfoundland is excellent with kids and most suitable to live in large open spaces. These jolly giants hail as one of the cutest big dog breeds. These fur balls will lovingly keep watch and protect you and your family. They’ve been documented to grow as large as a whopping 200 pounds so get ready! Petland puppies are prized possessions for anyone who owns one! We know it and so do our customers – past, current and potential. We pride ourselves in providing information about the various dogs that we sell. Today, we’re highlighting the cutest mixed breed dogs, otherwise known as designer breed puppies, in our stores. Take a list of the five hybrid/designer dog breeds that you’ll certainly love. The Yorkipoo is a cross between the Yorkshire Terrier and a Toy or Miniature Poodle. These sweet and charming pups won’t allow you to go far without capturing the attention of passersby. They are incredibly gentle, kind, and loving dogs who can do well with children and the elderly. What’s a Maltishi puppy? Blend a Maltese and Shih Tzu and you’ve got one of the most stunning and cutest mixed breed dogs. Taking in love from laps around the world, these furry babies are natural companions. They are intelligent dogs with relatively quiet and chill personalities. They long to be around family and they’ll gladly choose your lap anytime. Did you do a double take when you saw your first Pomsky puppy? Most people do because they truly resemble fluffy miniature Huskies, making them one of the cutest mixed breed dogs to own. Pomskies are the cross between the medium-sized Siberian Husky and the pint-sized Pomeranian. They are gaining popularity, as their origins only date back to 2011. Take a Schnauzer and a Poodle and you’ll wind up with a boastful breed that’s one of the popular low-shedding dog breeds. They range from 10 to 25 pounds and come in various beautiful colors. Some will look more like Poodles and others may have a more dominant Schnauzer look. In either case, they’re exquisite little creatures! That’s what they seem like because Teddy Bear small dog breeds are the combinations of Shih Tzu and Bichon Frise puppies. They are fluffy and are stuffed with cuteness. Weighing in around 5 to 15 pounds, these beauties can give you 15 to 18 years of love and companionship! We have these Petland puppies in our stores and they’re only a call and visit away! Check out our available puppies page by clicking here! Have you seen a dog that looks something like a Chihuahua but it’s too large to be one because of the longer body? If you’ve answered “yes,” then it’s very likely that you’ve seen a Chiweeine for sale. 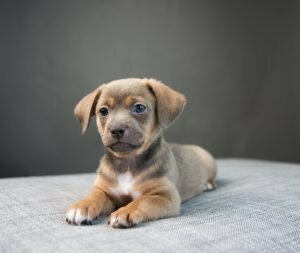 A Chiweenie is a cross between a Chihuahua and a Dachshund and these petite pups are the latest craze of designer small dog breeds. We’ve compiled 5 facts about these somewhat elusive and exclusive breeds. Check them out! Fact 1: These pups are extremely intelligent, however, because of their, shall we say “independent personalities” they tend to be a bit hard to train. They’re stubborn little stinkers. There, we said it! You’ll need some patience with them. Fact 2: If you’re looking for a dog that will have a long life span, then purchase a Chiweenie for sale, because they have an expectancy between 12 and 15 years! Fact 3: Chiweenies will be best in homes with older children and no pets. They are reportedly rather selfish with their owners affections and sometimes don’t get along well with other pets. Fact 4: They’re highly sociable dogs and enjoy spending time with their families. In a house of several family members, they have a tendency to develop a closer bond with one family member. They’ll show their extreme loyalty to that one person forever! Fact 5: Of course, they are one of the small dog breeds, weighing in at a whopping average of 8 to 12 pounds! Fact 6: Want a watchdog? We’re pretty confident you didn’t think of these small dog breeds, but if you’re in the watchdog market, consider Chiweenies for sale! They won’t attack but they will bark…a lot! They also have a reputation for being aggressive to go along with their barks and defending their owners against threats. Fact 7: These aren’t cookie cutter dogs! You’ll find that no Chiweenie for sale will look like another. That makes them undeniably unique and part of the rising adoration for them. Fact 9: This goes without saying, but we’ll mention it. They are absolutely perfect for an apartment. They don’t require a lot of exercise or space. Fact 10: Chiweenies are very low maintenance dogs. Their grooming is simple. Their personalities are quirky and cool. They live long lives. They’re loyal. They’re the perfect little blend of two feisty but fun dogs! Want to check out any available Chiweenies for sale we have in our store? Just click here! The Perfect Winter Puppies that Make Great Snuggle Companions! Are you considering whether or not to buy a puppy this winter season? Well, if you are unsure which dog breed you should get that will do extremely well in this cold winter weather, consider the dogs in the list we’ve compiled. All of these dogs are extraordinary winter puppies that love the cold weather, maybe even more than you! Each of these dogs has a thick furry coat to help them handle the cold weather, which is an important thing to look for when searching for winter puppies. Here are just a few dogs that you may want to consider! 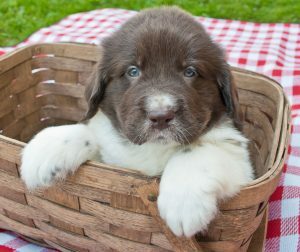 Can’t wait to check our all of our adorable puppy breeds? Just click here for the cutest puppies you’ve ever seen! Akitas are great winter dogs because they are snow dogs! These dogs enjoy every moment spent in the snow with their thick furry coats. If you also enjoy outdoor activities in the winter, then an Akita is an appropriate dog for you. These dogs are courageous and willing to go on outdoor adventures with you. They are also really receptive to directions, so they are pretty easy to train especially in the snow they love so much. These dogs are awesome for the winter weather too! They do not require that much exercise if you are not interested in a lot of outdoor activities but they will really enjoy the time you spend with them outside just as much as the time you spend with them inside the house. These dogs have incredible strength and speed and would make the perfect company for adventures in the winter. These dogs really love the outdoors and thankfully their winter coats are extremely thick to protect them from being cold. Germans really enjoy playtime spent outside in the winter and would love to travel with you on your winter trip to the mountains. These dogs are awesome family dogs that are willing to play with everyone outside. 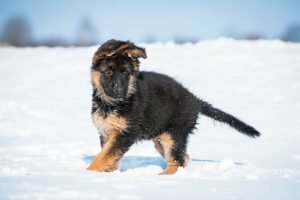 These are just a few dogs to consider when buying winter puppies this year. These dogs are great friends in the cold weather, and really any other time of the year. You can not beat the type of friendships these dogs will build with you this winter. If you are looking for a companion to join you on your winter adventures think about buying one of these winter puppies at one of our Petland locations. The weather outside is frightful and extremely not delightful for a dog to walk in without paw protection. You probably wouldn’t walk outside barefoot in extremely frigid temperatures, so your pup probably doesn’t either! Some pet owners don’t consider this during the winter season. Here at Petland, we recommend that you purchase dog paws shoes to protect them from many dangers during the unpredictable winter weather. 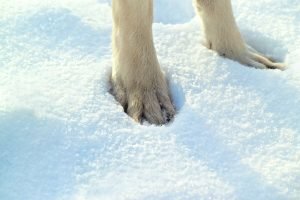 Here are some reasons you should invest in paw shoes for your dog this winter. Want to see which puppies we have that love wintertime? Click here are our available snow puppies! Don’t forget about the doggos! Dogs’ paws can only withstand temperatures as low as 20 degrees Fahrenheit before their paws start to hurt really badly. No dog should be walked outside in weather below 0 degrees without warm paw covers or you are putting your dog at risk for frostbite especially if they are not used to the cold. Broken ice can cut your dog’s paws. A lot of people forget that their dog’s paws are really fragile and hard broken ice can act as glass and be just as painful as stepping on a broken piece of glass. If you do not want your dog to suffer during a walk with a bruised paws invest some paw protective covers. They can slip on icy paths just like humans. This is where dog paw covers come in handy the most. These covers provide appropriate traction just like the boots on your feet so your dog doesn’t risk slipping on the ice and getting injured. It is extremely important that you take all means necessary for protecting dog paws in the winter. Paw shoes/covers are the way to go. Make sure that you get the right size because the fit is just as important in protection from injuries. French bulldogs also known as “Frenchie puppies” make the cutest dogs you’d ever did see! Here at Petland, we want you to know everything about the pup you are seeking to add to your family. Did you know Frenchies give birth by c-section due to their narrow hips – natural birth is almost impossible? Their litter is usually three to five pups on average. 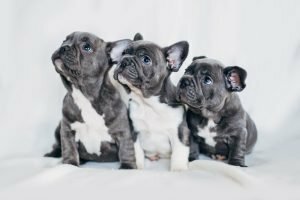 We will share some additional fun facts about French bulldogs to help you determine if they are right for you and your lifestyle. What is the best food for a Frenchie? What they eat is probably the most basic, but frequently asked question. It definitely makes sense to find out what a certain breed eats before making an investment. Frenchie pups should have a diet that is limited on grains. Limit giving your pup chicken as it can cause gastrointestinal irritation. Be sure to choose a higher quality food to ensure your dog is getting the best nutrients to be healthy. Petland feeds Health Extension brand dog food! What do I use to walk them? Use a harness instead of a collar to avoid choking them during walks. It teaches your pup not to pull when walking which can restrict their airways. Make sure to use a life jacket when swimming with your pup as they are top heavy and make horrible swimmers! Summer puppies or winter puppies? Frenchie pups don’t like the heat. In hot temperatures, be sure to find shade if you’re out with your pup. Be sure to keep water to make sure they are hydrated as well. French bulldogs also have a short coat and can be sensitive to cold weather in the winter. Investing in a coat to wear while your Frenchie pup is outside may be your best bet. Of course, this is definitely a deal breaker for any pet owner or potential pet owner. Fortunately, French bulldogs are easy to train, love affection, and are adorable. If you’re interested in learning more about French bulldogs, visit our store today. We can assist in making sure you are equipped with the information to make the best decision if this breed is a right choice for you and your lifestyle. Visit us at Petland today! Acorn Ridge is easily ranked as one of my personal favorites! The size and space of Acorn Ridge alone is a puppy loving vloggers paradise. They have a great laid-back feel and even a set up of lemon bars, sweet tea, and foosball in the entry room for their guests. All that aside, I am way more excited to meet the stars of my newest vlog, the dogs that call Acorn Ridge their home. Just imagine it, walking through a massive doorway and there they are… fuzzy Golden retrievers, floppy excitable Labs, and a myriad of colored poodles that are eagerly awaiting head pats, belly rubbings and boops. For those of you at home, you know there’s no better feeling than walking in the front door and having an excited dog that’s been waiting on you… their favorite human. And while they may have never met me before, the doggos of Acorn Ridge love meeting guests, which they do frequently as an integral key to their socialization. After politely asking to step inside, I’m struck by the sheer size of the individual kennels, even at 5”10 my wingspan alone isn’t enough to reach side to side. A golden named “Goldilocks” immediately rushes me and in two seconds flat I’m being smothered by kisses and struggling to balance my camera. After capturing a few meet and greets with the happy citizens of Acorn Ridge, I’m on my way to the nursing areas to meet the newest and tiniest members of the kennel. I wash my hands and arms thoroughly, (these are babies after all!) and gently approach the new liters. Puppers as young as 2 weeks old, that have yet to even open their eyes, squeak and roll about as my heart melts into a puddle. The pups as old as 6-7 weeks old are full of energy and giving their mom a thorough run for her money. Thankfully, each nursing area is equipped with a lifted area for new moms to get their fair share of “me time.” I can only imagine her relief when I stepped in, allowing the rambunctious puppies to have a shiny new source of entertainment. Meanwhile, all the moms, while very friendly floofs, kept a close watch on their precious pups. As you can imagine, greeting young puppies is always a joy, but the socialization yard is where the real work starts for our team. Acorn Ridge has three yards, and you guessed it…we got to film in all of them! As it’s still early, this is the adults first release of the day, so I try to prepare myself for the intense cardio I’m about to do, check you later treadmill! But I quickly found out that if you think you can outrun a Golden Retriever…you’re wrong. So wrong. As seven Goldens rush the field, it’s go time! Tire chews, tennis balls, and ropes are all claimed within seconds, the bright sunshine overhead making this day one for the books. We spent over three hours filming Acorn Ridge and by the end of it, I had plenty of laughs and my fair share of exercise. Acorn Ridge provides a warm, welcoming feeling to all that come to play and has an authentic atmosphere of pure joy. This facility was not only pristine, but quite heartwarming as the people, pups and guests are all in the perfect harmony that only life with animals can truly provide. 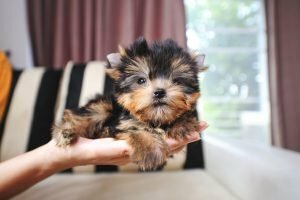 Are Puppy Teacup Breeds Worth the Hype? There has been a lot of hype around teacup breeds for their petite stature and, of course, undeniable cuteness. The idea of putting your dog in your bag and taking off to the grocery store seems cool and very on trend, but is there another side to the story? The popularity around small dog breeds has the tendency to focus more on the look of the dog versus the health factors, which can cause problems for owners down the line. Petland wants to ensure you’re equipped with what you need to consider before becoming a teacup breed owner. Focus on the long-term health rather than the look. The word “teacup” can be misleading as it is a trendy market term that is attractive to buyers seeking small dogs. As cute as they are, small breed pups can come with a big load of health issues. Of course, choosing a healthy pup can not only benefit the owner from high expenses at the veterinarian, but make owning a teacup dog more enjoyable. At Petland, we take pride in educating our customers on how to care for their pets. Our pet counselors are knowledgeable and up-to-date with the information needed for the proper care of your pets. A small dog can be a great companion. While teacup breeds are appealing and cute in size, it is important to care for them properly. A great benefit in having a teacup breed as a pet is, if you travel frequently, they are much easier to fly with on the airplane. They don’t require much room and travel easily in a small tote comfortably. Teacups also don’t consume much, which keeps the food cost down. They are also good dogs for people who live in small environments, such as a tiny house or a recreational vehicle. If you’re not careful, you may buy a dog from a breeder that doesn’t have the same integrity or safe practices that we have here at Petland. Petland has very strict requirements when it comes to vaccinations and other prophylactic measures and our veterinarian care is bar none. There are many things that happen before teacup breeds leave the store and the puppies must meet our standards before they are Petland puppies. You can trust us with providing you with the correct education to care for your pets! Want to see all of our available puppies before heading down to our location, just click here! Having a new cute puppy dog can be almost identical to having a new baby. Puppies need an ample amount of love and care after they go to their new furrr-ever homes. In the beginning, getting up in the middle of the night to check on your pup because they may be crying, hungry, or afraid could happen quite frequently. Petland wants to offer you a few tips and suggestions to make the transition in adapting to a new dog enjoyable and pleasant. Can’t wait to see all of our adorable puppies for sale? Just click here! Young pups are energetic and full of excitement when they are newly born. Dog owners typically work all day and whey they get home they would like for the dog to sleep when they do. New pups need a good amount of stimulation to help them sleep during the night. Make sure they have playtime before bed. You can play catch with your new pup outside or have some fun toys they can chase after to tire them out. Try going for a walk every evening and make it a routine for consistency. 2. Be creative with their food. Make sure they have a good meal before bed. You can try putting dog food inside of a teething chew toy or hollow bone to have them work for their food to tire them out. 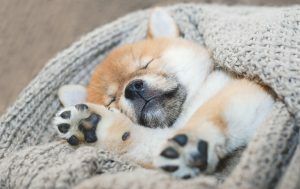 Keeping your puppy physically and mentally active is the key to keeping them asleep at night. If you have a family, you can incorporate your family members in an activity to increase your pup’s stimulation. 3. Walk your dog before bed. Make sure to take your puppy to the bathroom before bed. Putting them to bed with a full bladder will surely keep them up at night. Also, you can try covering the puppy crate a bit to control light and sound when it is time for bed to help your pup transition between morning and night. Limit the amount of water you give your pup in the evening – be sure to check with your veterinarian as certain breeds may have different requirements. Check out Petland’s puppies for sale to find a new family member for you and your family!